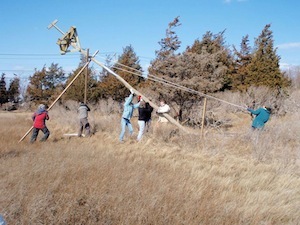 • The Group for the East End need some strong helpers to get an osprey pole up in Southold this afternoon at 3 p.m. Call their office for more information at 631.765.6450. • Fishermen out in Montauk had a lot to say to the federal Bureau of Ocean Energy Management about offshore wind farms yesterday. The Beacon’s full story is online here. • New York State Assemblyman Fred Thiele, the only Independent member of the New York State Legislature, has introduced a constitutional amendment in the legislature which would establish an open primary system for congressional and state elections in New York. A similar system was enacted in California in 2010. The amendment would allow all voters to vote in the primaries without regard to party preference of the voter. • The Beacon’s report on Dr. Chris Gobler’s State of the Bays is online here. The state is not great, he says. • Buddhist author Mark Epstein, M.D., whose most recent book is “The Trauma of Everyday Life,” will be the guest speaker at Writers Speak Wednesday at Stony Brook Southampton tonight at 7 p.m. More information is online here. • The Montauk Chamber of Commerce’s annual vacation guide to Montauk is now available online.